The Doc euthanises a young bride-to-be, tortures millions of people to death, and then Mickey and Jake go to France. 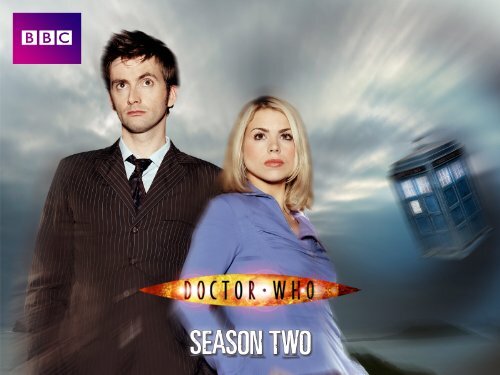 The Tenth Doctor, Rose and Mickey (aka Ricky) escape with Parallel-Universe Pete Tyler, Ricky (aka Mickey) and the rest of the resistance through an astounding deus ex machina, and now the battle for, erm, “Earth” really kicks off. Watch as they infiltrate Battersea Power Station, where Lumic’s Cybermen are upgrading “everyone in London”, confront Lumic himself, and run into some emotional turmoil along the way. Then listen to us pick it all apart. It’s difficult not to love this episode – it’s clearly better than Rise of the Cybermen, i.e. part 1 of this double-feature – but there’s plenty to deride as well. This is the weaker part of this double feature by some way. The coolness factor is stretched a bit thin; most scenes with Jakey-boy make me cringe. Logic as a concept barely skirts this instalment. Mrs Moore, however, does a decent job. The Sally Phelan scene is heart-rending! But walking in through the front door? How could that be anything other than a recipe for capture? Perhaps that’s less obvious in an audiobook; conversely, perhaps the attempted epic climax looks better in your imagination. –0.5 for there actually being a big box saying ‘Transmitter Control’. That everything then starts exploding is nonsense. Mickey played ‘Blimp Pilot’ on the PS2? The emergency ladder. Throwing the wheel to the right meaning going up (so how do you ever turn right?!). The Cyber-Controller grunting and groaning at physical effort. Rope is a construction (as opposed to wood just being shaped), hence the sonic works on it? For 5 minutes it is nothing but nonsense, like they’re in some parallel… wait. And where’s the credit from Doc for Mickey? And then Mickey’s goodbye is horrendously overblown. Show Notes: 1) What’s the problem with Doc expending 10 years of his life on recharging the crystal when his little stunt, by forestalling maximum deletion, has now extended his life by about a millennium and counting? 2) There really is (as also discussed in your Tennant retrospective) the laziest sonic moment ever in this one. Sack the editor, because what were they doing that week? –1 full point. 3) ‘6879760’ is ‘buffalo’ in hexadecimal, that code would destroy freaking Skynet. 4) Is ‘Delete’ in French something like ‘supprime’?